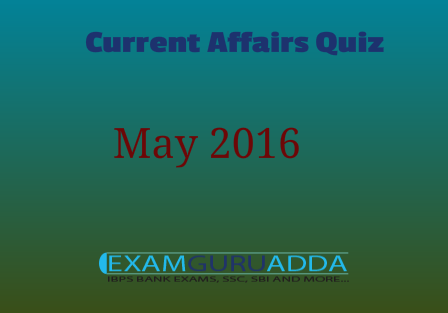 Dear Readers Examguruadda.in presents Current Affairs quiz of 25 May and 26 May 2016 that cover important current affair events. Current Affairs quiz prepared according to the latest Bank, SSC and other competitive exams. 1. Which country’s women badminton team has won the 2016 Uber Cup tournament? 2. Which indigenously built highly maneuverable Fast Attack Craft has been commissioned into Indian Navy? 3. Who becomes first woman to win Millennium Technology Prize? 4. Who was sworn-in as 12th Chief Minister of Kerala? 5. The Indian citizens have been barred from travelling to which country recently by the Government of India (GoI)? 6. Union Government signed 100 million US dollar loan and project agreement with World Bank to support Urban Water Supply Modernization project of which state? 7. Saudi-based Islamic Development Bank (IDB) recently announced to open its first branch in India in which state? 8. The United Nations World Humanitarian Summit was held at which place ? 9. With which country did China signed an agreement to build its first nuclear reactor? 10. Who is the author of the book “The Bones of Grace”?